After his brother dies in an accident, young Hiro inherits his science project – a medical robot named Baymax with a pot belly, no face, but lots of charisma. 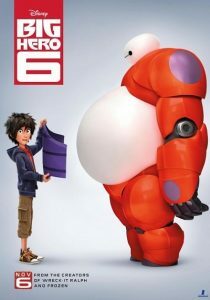 After a kabuki-masked villain steals his invention, Hiro and Baymax, with the help of his brother’s friends, form the “Big Hero 6” team and fight the evil master plan. When, in 2013, Disney started to promote “Big Hero 6”, the new movie from their Burbank Studios seemed to be something that was bound to happen sooner or later: an animated super hero movie that would introduce the genre to younger audiences who love heroes but perhaps do not read the comics or get all the shades of gray between Marvel and DC comics – or couldn’t care (more or) less. Like in Marvel’s “Guardian Of The Galaxy” Disney took an obscure comic and transformed it into the goose that lays the golden egg, with production resources and money that only they could afford. Marvel Studios said that “Big Hero 6”, even though based on their comic book published in 1998, is not part of the “Marvel Cinematic Universe” – which is like saying that chocolate is not made from cocoa or that we do not know that since 2009 Marvel has been a Disney franchise. Stan Lee’s appearance in the final cameo says otherwise. “Big Hero 6” comes to us from people who are well able to make animation and under John Lassiter’s supervision, from “Bolt” to “Frozen”, the “Chicken Little” era is truly a closed chapter. With the exception of “Cars” spin-off “Planes”, Disney Digital Animations is becoming a rival not only to DreamWorks Animation but to Pixar itself. Movies like “Big Hero 6”, with the funny “Totoro-esque” robot “Baymax”, are becoming fresh new icons for a younger audience and this is good for animation, even if the tradition is increasingly turning into a Japanese-style production like “Princess Kaguya”, which may not be an Oscar © contender but is a winner in terms of the essence of animation.